The Ontario Power Generation Bruce nuclear facility as seen from a beach off Lake Huron in Kincardine, Ontario. Canadian utility giant Ontario Power Generation says the layers of rock where it proposes a deep underground nuclear waste storage facility are solid, stable and well-suited for the job. But what’s at the surface and less than a mile away — the shores of Lake Huron — has people on the Michigan and Canadian sides of the Great Lake fiercely opposed to the plan. “I’m up in arms,” said Michigan resident Sherry Hummel of Williamsburg. “It’s just a dangerous, dangerous thing to do near 20% of the world’s” unfrozen surface freshwater. For the 24 million U.S. residents who get drinking water from the Great Lakes, and those making their living from Michigan’s $2.4 billion fishing industry and $13 billion tourism industry, it’s a vital policy decision over which their elected representatives have no control. This week, a three-person Joint Review Panel appointed by the Canadian government will conclude a public comment period on the utility’s plan for a deep geologic repository near its Bruce nuclear facility near Kincardine, a shoreline community of about 11,000 residents about 115 miles northeast of Port Huron. The panel will issue a recommendation in coming weeks to Canada’s Cabinet, which will in turn approve, reject or require modifications of the utility’s plan. The facility would be more than 2,200 feet underground in a layer of limestone, with a 660-foot layer of shale above. There, containers of radioactive waste from Ontario’s 20 nuclear reactors would be stored in created corridors. Most of the disposed items would be low-level waste, such as mops, rags, floor sweepings and clothing — items that can be safely handled by workers without any special radiation protection, according to the utility’s proposal. 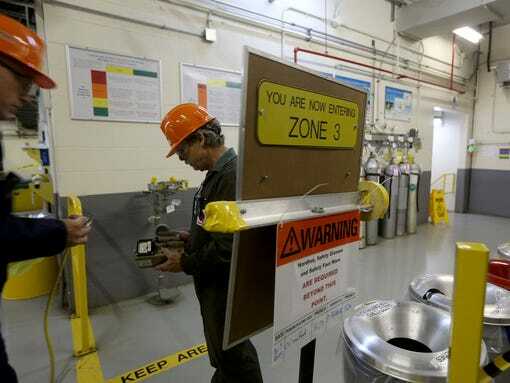 But the underground facility also would take intermediate-level waste, “things like filters, resins, things that are closer to the nuclear core,” said utility spokesman Neal Kelly. “They are much more radioactive and need to be handled with a lot more care,” he said. Ironically, among those most supportive of the repository are those who would live closest to it — Kincardine residents. The radioactive waste is currently stored aboveground in warehouses adjacent to the Bruce nuclear site, and Kincardine Mayor Larry Kraemer said city officials approached the utility more than a decade ago about finding a more permanent solution. A hosting agreement for the repository between Ontario Power Generation and Kincardine was signed in October 2004. Kraemer said he won election in 2006 and re-election in 2010 on the promise to get the repository done. In an area where most people either work on a farm or at the nuclear plant, the repository means needed jobs, Kraemer said — up to 500 jobs during construction; then up to 40 permanent jobs to operate. “These people know nuclear; they know the safety of it, and they choose to live here,” he said. Not all agree. Beverly Fernandez lives in Saugeen Shores, Ontario, about 20 miles from Kincardine. She helped form the nonprofit organization Stop the Great Lakes Nuclear Dump after learning the project was years into development before she’d ever heard about it, despite living next door. The group has gathered more than 38,000 online petition signatures from both sides of the border calling for rejection of the project. “Ontario Power Generation did not consider any other sites for the location of this nuclear waste dump,” Fernandez said. “A few thousand people in the small town of Kincardine are making this decision on behalf of 40 million people” living around the Great Lakes. The proposal also caught some Michigan lawmakers off guard. Democratic state Sen. Hoon-Yung Hopgood said public awareness of what the utility proposes drops off dramatically outside the host communities around the Bruce nuclear plant. “I’m really disappointed in the outreach process, particularly in Michigan,” he said. Kelly said outreach to Michigan began in early 2005, with information provided to the Michigan Department of Environmental Quality even before the utility sought a license for the facility in Canada in December that year. Records with the Canadian Environmental Assessment Agency show notices of opportunities for public comment on the project dating to 2008. While Ontario Power Generation officials briefed Michigan lawmakers and agency officials on occasion in subsequent years, no public forums or comment opportunities were offered on the deep geologic repository proposal in Michigan, according to outreach records provided by the utility. Hopgood and Democratic state Rep. Sarah Roberts testified earlier this month at the Joint Review Panel hearings. Hopgood’s testimony included letters of concern from a host of Michigan commercial, sportsmen and environmental groups, including the Michigan United Conservation Clubs and the Michigan Boating Industries Association. A room is filled with long wooden boxes, each including long, cylindrical rocks of varying colors and textures. It’s where the Canadian utility keeps the core rock samples of its test digs in developing the repository. Some of the rock brought up for study from thousands of feet below the surface is more than a billion years old. “The key thing about these sediments is they are thick, old and stable,” said Mark Jensen, a geologist contracted to evaluate the suitability of the site. The downward shafts pass through a groundwater layer at about 550 feet, but waste would be stored more than 1,500 feet farther down, beneath layers of shale and limestone. “These are about the best protective barriers you can get,” Jensen said. The facility is being designed to last “a million years,” he said, including accounting for the possibility of future ice ages and the return of glaciers to the region, as well as a potential earthquake of up to magnitude 7.5, though no earthquakes greater than 5.0 have been registered in the area over the past 180 years. The repository would likely be filled within 35 years, at which time the utility would seek decommissioning, a regulated shutdown process. It would then be capped with concrete and clay and essentially left, with no further maintenance needed, according to Jensen. An East Lansing resident uniquely qualified on the subject of disposing of nuclear waste is less concerned about the repository’s proximity to Lake Huron than the rock in which it is being built. “You have to really be concerned about the nature of the geology in which the wastes are being stored,” said John Cantlon, a former vice president of research and dean of the Graduate School at Michigan State University, who served on the U.S. Nuclear Waste Technical Review Board for nearly eight years under Presidents Ronald Reagan, George Bush and Bill Clinton, including four years as the board’s chairman. 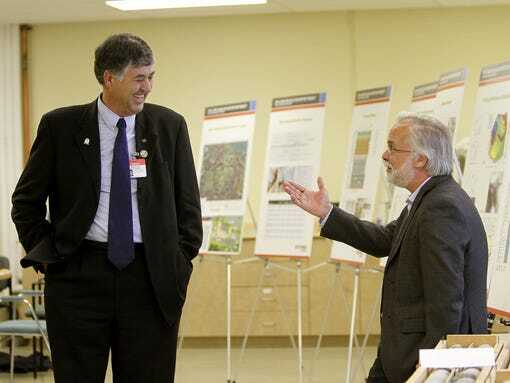 Though he has not reviewed the scientific specifics of the Canadian utility’s project, when told the facility would be built in a layer of limestone, Cantlon said, “I would be a lot happier if it were granite,” a denser rock through which water is less likely to flow. But Cantlon said an even bigger worry for those concerned about the Great Lakes should be continued storage of high-level radioactive spent nuclear fuel at operating and decommissioned nuclear plants throughout the region. Fifteen sites in five U.S. states and Ontario store spent nuclear fuel in wet pools or dry casks within 1 mile of a Great Lake, including four locations in Michigan. “That’s far, far more dangerous and susceptible to terrorist activity,” Cantlon said. With the Joint Review Panel wrapping up its work, Michigan residents hoping to weigh in on the repository are nearly out of options. Hopgood suggested contacting members of Congress. Michigan’s U.S. Senators, Democrats Carl Levin and Debbie Stabenow, last week sent a letter to U.S. Secretary of State John Kerry, urging his involvement in helping the Canadian government reconsider the location of the repository and asking that Kerry engage the International Joint Commission, a binational organization that guides the U.S. and Canada in resolution of boundary water issues. If approved by the Canadian government, construction of the repository would take five to seven years, said Kelly, the utility spokesman. Meanwhile, Stop the Great Lakes Nuclear Dump is continuing an effort to make residents and local governments aware, attacking the proposal one resolution at a time, Fernandez said.